Assembla SVN makes it easy for your entire software team to collaborate on code development and changes with built-in features like auditing, permission management, and code reviews. Importing an SVN repository directly to Assembla is so simple it can be accomplished in just three easy steps! The compressed zip file is what will be uploaded to your Assembla Space. 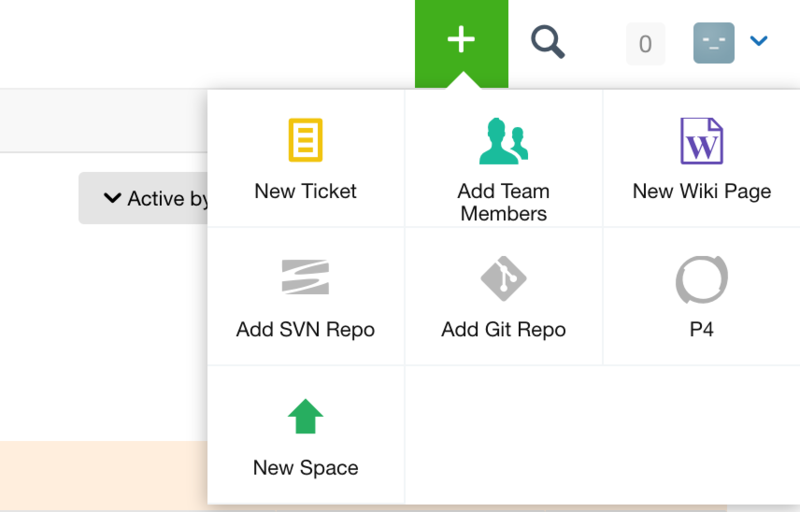 If SVN is not listed as an installed tool in your space, you will need to add an SVN repository. 2. Click on the Add (or Add another) button next to SVN. 3. The newly added Subversion (SVN) repository will appear in your navigation bar named as SVN (number - if any). To import an existing SVN repository, simply navigate to the Import/Export subtab and then browse your computer for the correct SVN dump file. For dump files larger than 200 MB, please use the option "Upload from a web directory", shown in the GIF above. Make sure that the URL used for this option is the direct download URL. Some file sharing services provide users with a URL that leads to a landing page instead of directly downloading the file. This can be fixed on most file sharing services by simply modifying the URL. Additionally, make sure that, at the end of the link, "dl=0" has been changed to "dl=1". That will ensure that the link you provide is a direct download link. After logging in, you can either click on the green (+) button and then Create New Space or you can select Create New Space from your Portfolio home page. Name your Space with a unique name. If the Space name is already taken, please use a different name. Once you have named your Space, choose your set of tools. 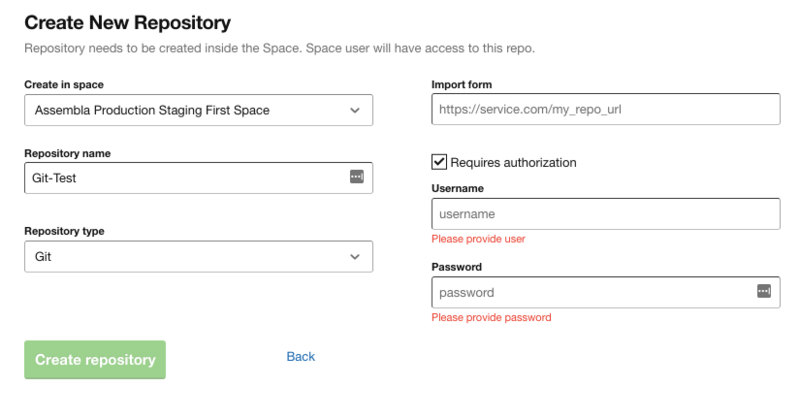 If you would like to remove repositories or add or remove other tools to your Space at any point, please go to your Space's Admin > Tools page. You can do so by going into your Space, clicking the Admin tab, clicking Tools, and clicking on the Add button next to the tool you would like to add. Note: If you are not the owner or payer of the space, you will not have access to your Space's Admin tab. 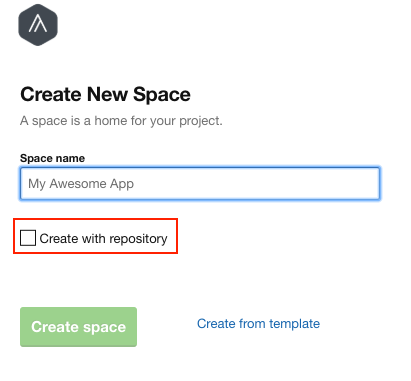 When creating a new Space, you can create the Space with a repository by checking the Create with repository box on the first step. 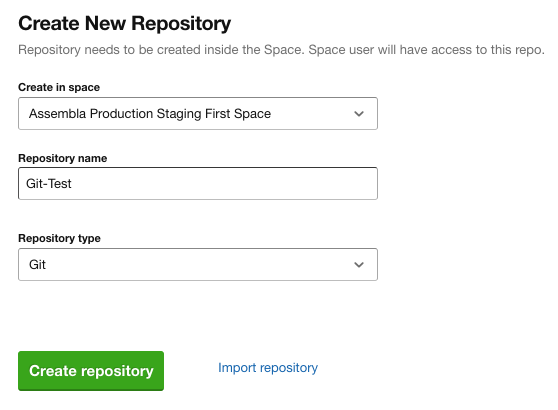 Alternatively, if you would like to create a repository in an existing Space, click on the green (+) button and select New Repository. The wizard will ask you to select the Space you would like to create your repository in, as well as what you would like to name your repository and what type of repository it is. If you would like to import an existing repository from an external location, select Import repository and enter your repository's URL and, if necessary, access credentials.